You may have heard of phytochemicals, including a number of the polyphenols, without knowing it. They are often the subject of news reports that cover research studies. The claims can include anything from red wine, coffee, and tea to fruits and vegetables that help lower cholesterol or blood pressure, decrease the risks of diabetes or cancer, or lead to a longer life. Polyphenols are a complicated group of plant-based chemicals. They're found in everyday food and available as supplements. Before you go overboard on seeking them out, however, it's a good idea to understand them. Isolated compounds are often extracted from plants and examined for their potential health benefits. When it comes to research, they sometimes—but not always—have impressive results in the lab. 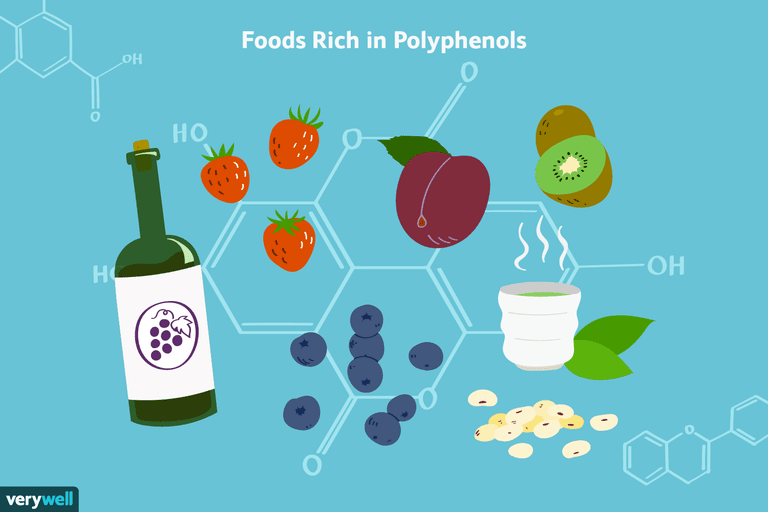 Foods rich in polyphenols certainly are good for you. However, it's difficult to know how much of that benefit is actually due to the specific plant compound or to all the nutrients, fiber, and other phytochemicals also found in those foods. The polyphenols typically act as antioxidants. They can help prevent cellular damage from free-radicals that occur with pollution, smoking, eating rancid foods, and as a byproduct of normal metabolism. It's also thought that polyphenols contribute to the body being in an anti-inflammatory state. This is also associated with a lower risk of several chronic diseases. Several polyphenols, such as quercetin, catechins, lignans, resveratrol, and curcumin, are touted as being anti-cancer agents. Researchers are continuing to study their effect on cancer cells so it's not known if they could prevent cancer or have any effect on cancer cells in a human body. Thinking in terms of chemistry, the polyphenols all have similar ring-shaped structures. You can tell them apart by the number of rings and the other molecules attached to those rings. Thus, polyphenols are grouped into four different categories based on those differences: phenolic acids, flavonoids, stilbenes, and lignans. Phenolic acids include compounds found in coffee, tea, grapes, red wine, berries, kiwi fruits, plums, apples, and cherries. They are found in other fruits and veggies as well, and even grain and corn. Phenolic acids are abundant in the diet and readily absorbed through the walls of your intestinal tract. You shouldn’t have much trouble consuming enough of them. In general, phenolic acids work as antioxidants but they also appear to promote anti-inflammatory conditions in the body. Flavonoids are a group of polyphenols that work as both antioxidants and anti-inflammatory agents. They are divided into several groups: flavones, flavonols, flavanones, isoflavones, anthocyanidins, chalcones, and catechins. Flavonoids are found in a wide variety of plant-based foods, including fruits, vegetables, legumes, red wine, and green tea. Flavonoids—sometimes called "bioflavonoids"—are often sold as dietary supplements. Stilbenes are a small group of plant chemicals and resveratrol is probably the best-known and the most studied of them. Resveratrol is found in red wine, blueberries, cranberries, and peanuts. Consuming these foods has been linked to better heart health. It’s hard to know how much of that benefit comes from the resveratrol. Although laboratory studies show that it works as both an antioxidant and anti-inflammatory agent in some laboratory animals, there is very little research that shows that it has any real effects on human health. Lignans are found in legumes, cereals, grains, fruits, algae, and some vegetables. The best sources include flax and sesame seeds. Eating a diet rich in lignans may be good for cardiovascular health, but research studies on humans are generally of low quality. Also, it’s not easy to eat a lot of lignans unless you take them as dietary supplements or gulp down spoonfuls of flax seeds. Some polyphenols, such as epigallocatechin gallate (EGCG) and resveratrol, are sold as dietary supplements, usually marketed as antioxidants. Current research suggests that you'll get the most benefit if you get your polyphenols from foods rather than supplements. Start with a breakfast featuring whole-grain cereal and coffee. Snack on fresh fruits rather than candy or cookies. Eat a salad or vegetable soup with dinner. Load your dinner plate with veggies and cut back on the heavy meat and cheese. Enjoy berries as a bedtime snack if you're hungry. The evidence is stacking up that polyphenols are beneficial to your health, though there are still many questions to be answered. It is clear, however, that eating foods high in these plant chemicals is good for you. Choose a balanced diet with lots of colorful fruits, fresh vegetables, whole grains, and legumes and you'll get plenty of polyphenols. Khurana S, Venkataraman K, Hollingsworth A, Piche M, Tai TC. Polyphenols: Benefits to the Cardiovascular System in Health and in Aging. Nutrients. 2013;5(10):3779-3827. doi: 10.3390/nu5103779. Novelle MG, Wahl D, Diequez C, Bernier M, de Cabo R. Resveratrol Supplementation: Where Are We Now and Where Should We Go? Ageing Research Reviews. 2015;21:1–15. doi: 10.1016/j.arr.2015.01.002. Soldati L, et al. The Influence of Diet on Anti-Cancer Immune Responsiveness. Journal of Translational Medicine. 2018;16:75. doi: 10.1186/s12967-018-1448-0. Ware M. Why Are Polyphenols Good for You? Medical News Today. 2017.